irony. Even when it wasn't especially on his side. "Scully here," came Scully's voice, over the phone. There was a pause. "Stuck where, exactly?" "I can picture it," she said. longer. My palms are sweating." "Should I call for back-up?" "Oh no," Scully said. "You're wearing skates?" places he'd been in them in the past thirty minutes. things afoot in Kiddsboro, Georgia." "And what were you suggesting I do, exactly?" probably didn't even make roller skates in his size. handy, in case he tries to take me prisoner again." "Please, take your time," she said. but it hadn't updated its interior design since 1987. "What do you think, Scully?" concept of hot pink spirals." packet of sunflower seeds. "What's your theory?" rink's wall. "They vanish. Literally. Without a trace. rolling, and the disco ball is lowered?" Milton. See any room for a trap door there, Scully?" checked out. Were there other witnesses?" there, the next minute she was gone." disappeared. Leaving behind ... guess what, Scully?" continues to roll on without her." "Scully," smiled Mulder, fluttering his eyelashes. "You just gave me chills." Mulder? Was she in the running to win?" roller skater. One of a kind." and narrowness of the boy's face. Feeling.' Y'all know that song?" "Sure do," Mulder said. "Jennifer Beals, right?" patterns. Always in time. No falls." assistant manager here. Y'all with the police?" Scully. We're working on this case for the FBI." "You were here when Veronica Milton disappeared?" the bathrooms, the basement, the parking lot." "Did you know both girls, Kyle?" Scully asked. "You and all the roller girls?" repeated Mulder. know, the girls who compete in the competitions?" "Did Veronica get along with everyone?" Mulder said. just a knock-off of the national champion's in 1997." "Anyone in particular get mad?" Scully said. "Yes, sir, Veronica had a tendency to get stuck-up,"
think lots of people were," he said. "I'm sorry, Kyle," said Scully. said. "That's not very likely, Kyle." "Thank you," Scully said, surprised. "Is it natural? Do you mind my asking?" "But it's not a wig, that right?" Mulder's smirking. "It is definitely not." "Uh ... thank you," Scully said again. "Well, listen, y'all want some coffee or something?" asked Kyle. "I'm just about to brew up a whole bunch. crashing into poles left and right." probably look around the rink for a few minutes." special, and beautiful. That's all I wanted to say." "I used to have crushes like that, too," Mulder said. trick, don't you, Scully?" Mulder said softly. think it's a haunted roller rink, Mulder." write with my middle initial. A. For Andrew." disappeared, Mr. Scheme?" Mulder said. repeating it back to me? Gordon A. Schime?" "Gordon A. Schime," Mulder said, a little bewildered. "You work for the newspaper?" Scully said. competition in the far-out burbs." lot to go on here." the story on the disappearance. It was front page." beat. You have to love the irony." sass, and well executed jumps.'" "Her leotard was some kind of purple and silver,"
Mulder, eyeing a brightly-hued "Say No To Drugs"
how these competitions work to begin with." Gordon's eyes lit up. "You mean, a flashback?" look. "I mean, just explain it to us." when we're done? I have a deadline, see." himself amusedly, when you don't have any yourself. special personal sparkle, so to speak." "So Fiona, what are your chances today, do you think?" to guess. Do you think you're going on to regional?" "My mother always says, to show zest. Confidence. would be," Gordon smiled warmly, taking a step closer. when I'm nervous, I just think about other things." tried. "Somebody you have a crush on?" her smile. "Because actually, it's weird, Mr. Scheme." "Sometimes it gets as big as a real house, you know? "Sure, Fiona," he answered, carefully. should forget I said that, okay?" "Uh, okay," he said, staring back at her. to adjust the purple sparkly thing atop Fiona's head. "Are you ready to be a PPP?" Fiona's head, ever so gingerly. "Sure, Mom," Fiona smiled back. "Let's do it!" started," came a booming voice over the PA system. lines, her arms jutting out like bird's wings. "My god," Gordon said outloud. down, you're going to hit!" "I guess we should pay visits to the girls' families,"
some kind of nut, anyway." "Mmm," Mulder nodded, his mouth full. "What's your theory, Scully?" Mulder said. "Some kind of ... mass hypnosis," she offered lamely. "I'm going with time warp, I think," Mulder said. "Maybe they were going 88 miles per hour, right?" Delorean, is that it, Mulder?" "No, not like Michael J. Fox," Mulder said, sheepish. talking about speeds past the speed of light." And didn't say anything else. She looked over at him. "That's it for your theory, Mulder?" "And?" "And this rink was built in 1978," he said. "Before that, this land was devoted to a gas station. "So you're ruling out haunting, Mulder?" that we have no plan of action." we don't know how to proceed." same old argument any more." "You know what I mean, Mulder." "Do you roller skate, Mulder?" Scully said quietly. said. "I can skate backwards." sideways glance. "We could rent skates right now." about now, Mulder. Before we get in a rut." I observe and take notes." have any other leads." He gazed down at their plates. "My god, you ate those hot dogs?" "Who," Mulder began, "do you think did it, Mr.
"And did what, exactly?" Scully said. cautiously, "will it require a flashback?" "Please tell us, Mr. Schime," Mulder said politely. Mulder couldn't contain a smile. that the FBI was taking on Veronica's case." "So you were at the Milton house?" hanging out of the garbage can." "Blonde hair?" Mulder repeated. "Attached to a head?" I went to the garbage can to investigate." it together. But it was lopped off." "Oh yeah?" Scully said. "How?" kicks? He could wait in the car." "Mulder," Scully's eyes were ice. "It's not protocol." "Thank you," Scully said, uneasily. this town for Scully's tastes. "Oh, of course," Mrs. Milton said, more hesitantly. "We actually want to ask you about Fiona Emery,"
Scully said. "The second girl who disappeared." "Oh," Mrs. Milton looked surprised. "All right." piece leftover from one of our 'I Dream of Jeannies.'" "One of our 'I Dream of Jeannie' hair pieces?" It's a top of the line hairpiece. One of my best." such spectacular hair. My services are very popular." Mulder cleared his throat a little. "I see," he said. "How does one become a hair designer?" "Well, my family has been in hair design for years,"
but they are dead wrong. Let me show you." long red ponytail, you know. It'd be so cute." "Oh, all of them do now," Mrs. Milton said, smiling. and special, and ... happy." "And was Veronica happy, Mrs. Milton?" Scully asked. sadly, "is any sixteen-year old girl happy?" room. "Wanda, do we get HBO or not?" "Who's that upstairs, Mrs. Milton?" asked Mulder. are just some of the roller girls," Mrs. Milton said. Scully scowled. "Friends of Veronica's?" "Yes, just three -- Mara, and Whitney, and Ashleyann. "Come here a second," repeated the voice, insistently. go see what Howard wants." "We'll just be here," smiled Mulder, reassuringly. she has a Scottish kilt woven entirely out of hair." glass, was labeled with an ornate brass tag: "1891." "And it's hard to imagine where all of it came from,"
opportunity more than they need their hair." aren't there, Scully?" Mulder said, thoughtfully. into what she and Fiona were involved with." boy reporter and go pay a visit to Fiona's family." Scully rolled her eyes. "Why the reporter, Mulder?" "Why not? He needs the story." with the press over the years?" my name in the paper." at the local elementary school. Humble origins." amazing detail for my story." "Playing dumb is part of the act," Mulder suggested. "Southern belles aren't supposed to be good at math,"
experimentally. "You think somebody's going camping?" smile. "Have you come to ask about my Fiona?" "That's right," Mulder said. "Just a few questions." explained. "Actually, it's more of just an enactment. with our own strength of heart." looking away. "It seemed inappropriate." "It must be hard," Gordon said. tough it out and go." exclaiming. "I know exactly where we'll take you. We'll go driving up and down Davis Street." Scully, what's your real name? Your first name?" "Dana, we'll show you all the places we always go,"
"Yes," Scully said, "it is definitely real." for Scully's head. "I bet it's super soft, isn't it?" going to be driving on Davis Street, you know?" Veronica has a shirt that would fit you." "You could wear this skirt!" out there your age, you know!" "I want to wear all black!" smiled Mara. date," Ashleyann said, applying powder to her nose. "Oh, she broke up with him ages ago, Ashleyann,"
Whitney said, waving her hand. "He's history." Wyatt, who is, like, so in love with her," said Mara. "But she isn't the boyfriend type, you know?" "What do you mean?" said Scully. she was studying or something." "She wants to be an archeologist when she grows up,"
"Right," Ashleyann said. "An architect." "Like *that* was going to happen," Whitney added. college or architect school or whatever." wistfully. "Fiona is such a good skater." picked up from the counter top. "I really hope so." the most part, she is as sweet as can be." "I was a pageant girl myself," explained Linda Emery. just a pageant on wheels anyway." "I'm told that Fiona does very well in school, too,"
"Oh, of course," cooed her mother, smiling faintly. the judges always write on their evaluations." "I make most of her costumes myself, Mr. Schime," Mrs.
sequins. But it's worth it." well this year, Mrs. Emery?" was at the top of her game before this happened." hard, and kept up a positive attitude for so long." best to find your daughter." door. "Eloise, it is I!" Plummer!" boomed the voice again. out of character, once he's in." dramatically. "It's already too late." out to the Rebels. You've betrayed me to Rebel spies!" "Sir," Gordon began, "we were just leaving." representative of the federal government." loyalties lie with that stinking pig Jefferson Davis." "Is it loaded, Mrs. Emery?" he repeated. Captain Plummer. "You make me wretch!" can you speak to me so!" nothing to do with our ... plot." the door frame. "Come back, you son of a woodcock!" skates. "I'm Agent Mulder. Not Horatio." "I'll miss you, too, Horatio," she answered, smiling. "But you should be gone." "Agent Scully," called a voice behind her. "It's just your hair is so pretty," Mrs. Milton said. "You might look so nice with a ponytail. So young. Just if you wanted to sometime." "Thank you," she said, faintly. "I'll have to try it." another one, here's my card." "Thank you again," responded Scully, weakly. "Nice hair, Agent Scully," came another voice nearby. know where my partner is." all these eighties songs? It reminds me of college." "You went to college in the eighties?" said Gordon. "You're older than I thought." "There's naturally sexual tension," Gordon observed. "As in every working situation," Scully replied. "There's more than just a little in this one, though,"
"Do you want to get a drink, Mr. Schime?" Scully said. I could use a drink." "You're no closer to solving the case, I take it?" "Then I'm no closer to writing my big story," he said. becomes part of our self-identity." "Do you really think so?" Scully said. think of as everyday life?" don't see themselves as the stars of their own lives. place where you're always supposed to be top-billed." "But sometimes you don't want to be playing a role,"
Scully said. "Sometimes you just want to be you." "Do you believe that, Mr. Schime?" "Yes," Scully said. "I would agree with that." really you want to be getting it on." definitely not what I said." fishing. Forgive me; I'm a journalist." feel right playing," she said, thoughtfully. other people's expectations of you," Gordon nodded. "Well, that's easy enough to solve," Gordon said. Scully didn't know what to say. "What happened to your hair?" he asked. "Did you curl it or something?" he tried again. "Mulder," she said slowly, "what happened to you?" "And the Yankee soldier?" Scully said. "The rifle wasn't loaded, fortunately," Mulder nodded. "Should I check you out?" "But I am worried about this case, g-woman." "Did you?" "No," Scully said. And smiled. "Have you, by any chance, been drinking, Scully?" you from falling too much." Mulder. "I don't think I can do it." poorly for him. "Put on your skates, Mulder." champion, if you got Mrs. Emery to be your coach." 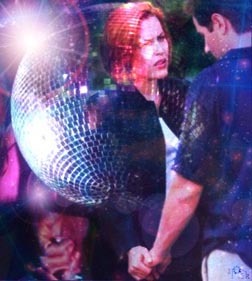 "I had my first kiss on roller skates," Scully said. for you to get some action." "Just remember that," Scully laughed. Scully smiled. "Maybe we can alternate." "No," Mulder said. "It's more than that." "Why don't we go sit down?" suggested Mulder. "Scully," he whispered. "How are you?" During Investigation,' by Gordon A. Schime." Scully smiled. "I'm glad he got something in." "Yeah, he's a good kid." "Mulder, why am I here?" "I was worried," Mulder added, softly. "Yes," Mulder answered. "I think it was." eyes. "Tell me a story, Mulder." able to do tonight," Mulder said. make them look more beautiful." away the sadness. So she said." wigs. But he was released. No evidence." chemically she did to the hair extension." "So she took matters into her own hands," Mulder said. said. "Starting with her own daughter." "Maybe they were transported to a different place,"
essence of them was reborn, maybe, into a new person." "It disappeared when you passed out," Mulder said. thought I needed to vanish, too." smiled. "You really don't know, Mulder?" be young and already so unhappy." "But she was wrong about me," she said softly. Too bad Gordon A. Schime isn't here, she thought.